‘Tis the last Sunday of March, ’tis clock-change day and therefore it must be the day of the Letterboxer’s Spring Meet. This prestigious event is held in the village hall at Lee Moor, previous venues have been the prison officers social club at Princetown, the Plume and Feathers at Princetown, and the Forest Inn at Hexworthy. So what happens at a ‘meet’? Basically it is very much a personal thing, some go to socialise, some go to ‘be seen’, others go to get the many day stamps, and then there are those that go to claim their membership to the 100 club. Maybe this needs a bit of explaining, there is and never has been an official Letterboxing Club but the unofficial 100 club organises and distributes the official, unofficial club clues. Twice a year catalogue is produced which contains all the current clues which only members can purchase. To become a member one has to turn up at a meet with proof that 100 letterbox stamps have been found, this then qualifies the proud bearer of said 100 stamps to join and purchase the catalogue. The amazing thing about the letterbox meet is the sheer number of people who attend, so why should that be amazing? Well, there is no denying that Dartmoor is a vast tract of land but one would have thought that in light of the numbers of attendees at the meet you would come across them on the moor from time to time – wrong. Most of them you will never see out there and that soon become apparent when you listen to various conversations regarding topographical knowledge – but hey-ho! Which category do I slot into? well firmly on the socialising side as the bar takings testify and the fact that as the years pass I now have to take the following day as holiday to recover – let’s have a piss-up shall us! The first hurdle of the day was to remember to put the clocks forward, the second was to find a parking space within 27 miles of Lee Moor. The former was successfully accomplished despite having attended a 40th birthday party the night before and having received a visit from the Tavistock Badger. The latter, on initial appearances, was also achieved and once the dog’s vomit had been cleared up we all made our way through dense fog to the village hall. Don’t take any measure of the density of the Dartmoor Mist from the above photo, this was taken on leaving not arriving. The hall was vibrantly throbbing with crowds of people shuffling up and down the lines of booksellers, magazine sellers, and clue sellers. It did not take long to find some familiar faces and the first two people I met were friends whom I had not seen for many years – this alone was worth the visit. After a good long chat about old and new times the dire news of the day was delivered, it was then 11.00am and the bar was not opening until 1.00pm. Coffee time, and the people of Lee Moor must be a posh bunch because the coffee was served in a cup and saucer, no plastic beakers here! This was one of those occasions when one was made very much aware of one’s mortality and the painful progression of time. The first very noticeable fact was the amount of grey hair, it was as if someone had liberally sprinkled a dusting of icing sugar over the many heads, mine included. Then came the ‘roll of honour’ of all the fellow boxers who had sadly passed away. Someone even came up with the notion of putting a letterbox walk out with stamps that commemorated the ‘lost boxers of the moor’. 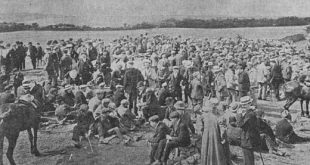 As I mingled amongst the throng, chatting to various boxers it also became clear the toll that years of tramping the moors in all weathers exacts. To name but a few, rheumatism, arthritis, worn knee and hip joints, etc etc. But the nice thing was that despite all everybody was still smiling and joking – ok the lengths of the walk may have shortened but the strength of the spirit still shone. By the time one circuit of the room had been accomplished the welcoming sound of the bar shutters being lifted rang out and called unto the faithful. The cold lager lubricated dry throats and the ‘boxing banter’ slid effortlessly into past times and moorland adventures. In those days the mists were thicker, the weather colder, the miles longer, and we had no poncy gadgets to navigate us through them. Today, it has generally been accepted that letterboxes can no longer be housed in army surplus ammo cans, they have to be in plastic pots and containers. But in those days if you were siting several boxes in a day you could have as many as 6 or 7 heavy ammo cans in your rucksack, imagine the weight, and it was nothing to walk 15 miles carrying such a load. Well in fact after the second pint it was more like 20 miles and by the third pint it was definitely 50 miles youngsters today don’t even know they are born? Not that there are many youngsters taking up the noble art of letterboxing. It must have been during the forth pint when we were up at Fur tor in 1997 when somebody announced that the locals were complaining about the atrocious car parking and had threatened to call the police – yeah, yeah. The desperate call for all boxers parked in the road to move their cars went by and large, in the case of the bar congregation it was ‘by’, unheeded. Jesus, the cheek of some people, so what if a ‘G’ reg. Ford Sierra is parked across your drive, don’t they realise it belongs to a boxer. It took a few moments and another pint to clamber back up to Fur tor but we eventually got there, we even managed to traipse on to Cut Hill and 1992 when another, more harassed appeal went out for the remainder of the cars to be moved. This time the threats not only involved the police but clampers as well and the actual registrations numbers of the offending vehicles were announced – silly sods should park more considerately. By the time my car had been moved I had completely lost the thread and everybody else was on Fox tor, heavens knows what happened in between Cut Hill and there? Just as one has to get a programme when visiting Twickenham to prove they ‘was there’, one has to get a copy of the Official Meet Stamp to show they ‘was there’, and so accordingly – impressed or what? There was even some talk that several parties of American boxers had travelled across to attend this illustrious occasion but whether the Dartmoor mist confused them or what, I never heard any strange accents, well apart from the odd strange mutters coming from the bar, that probably was more to do with the lager than the dialect. As with any meet, many people take one-day meet stamps and the rumour is that a person can sometimes collect their first hundred stamps at the meet alone. I think maybe on this occasion that would have been a struggle but I certainly took one which seemed to be well stamped at the end of the day. In the good old days the meet went on until very late and many journeys were recounted of how a gallon of ale, a Dartmoor Mist, and black Dartmoor Ponies stood in an even blacker road do not mix very well. But that was when the meet was held at Princetown and the pubs were open late. Today it was an early bath with time to reflect on a good day spent with old friends, memories and new acquaintances – roll on Autumn.